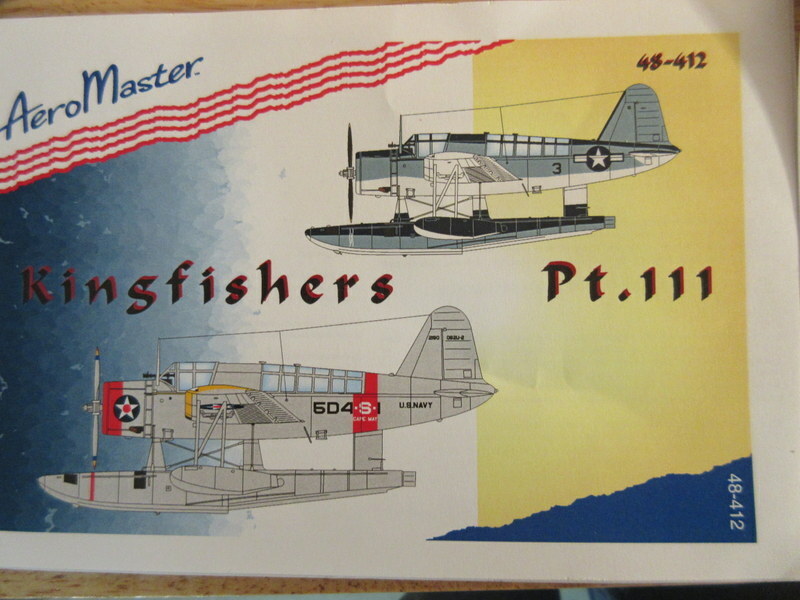 Painting of the Kingfisher continues. Not much work done over the weekend as it was the yard work holiday but we’ve got two out of three colors on the Kingfisher. 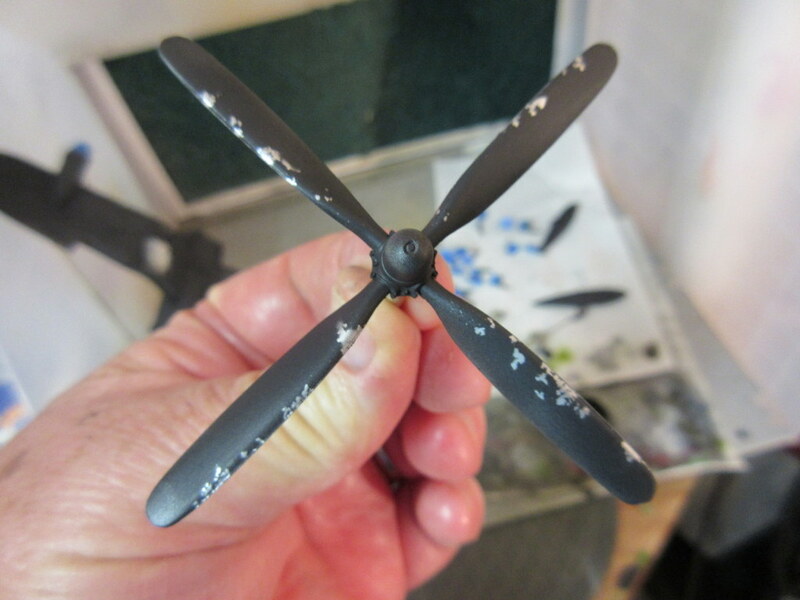 While I am waiting for these to dry I thought I’d get started on the Bf-110’s. 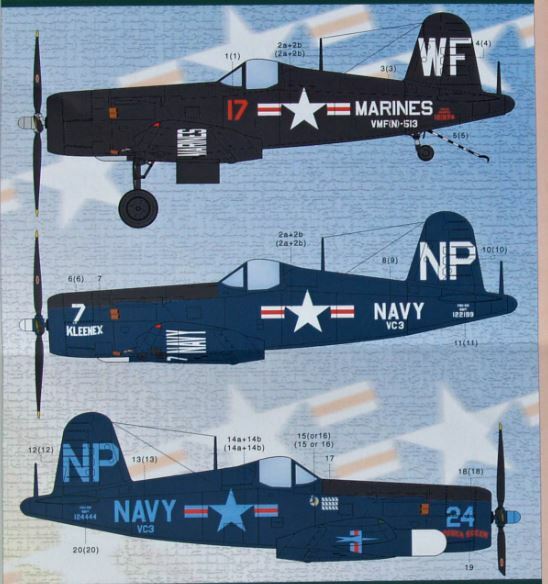 I want to build two nightfighter versions with a different scheme off of an Owl Decal sheet I picked up. 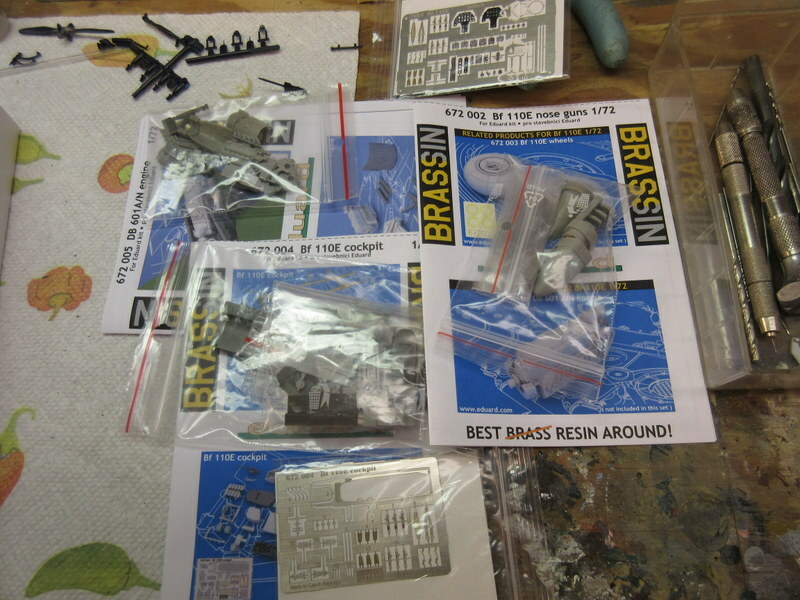 My initial plan was to use the Eduard Big Sin set I purchased to go with the Eduard Bf-110E Profipack. This set has a ton of detail and I was wondering what I had gotten these old eyes into, as I normally don’t do 1/72 scale. 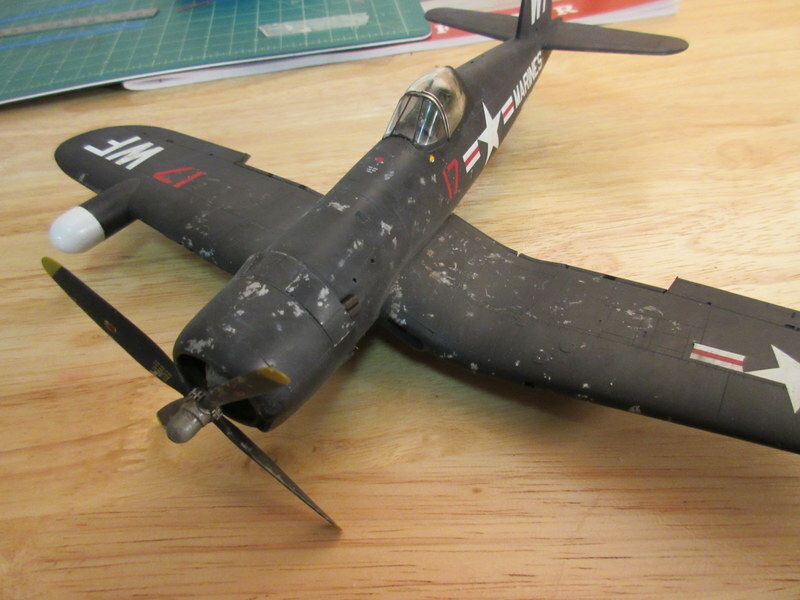 Game plan was to use the Big Sin in the Eduard kit and convert the Eduard cockpit into the sparse Monogram Bf-110 kit. 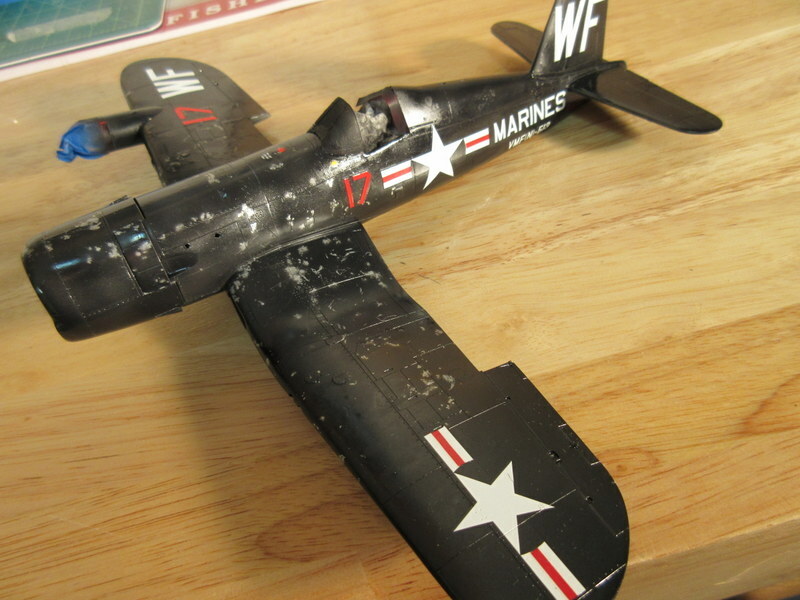 I’ve had this Monogram kit since the 60’s to put a nightfighter camo on it and I thought I’d build both of these kits at once. 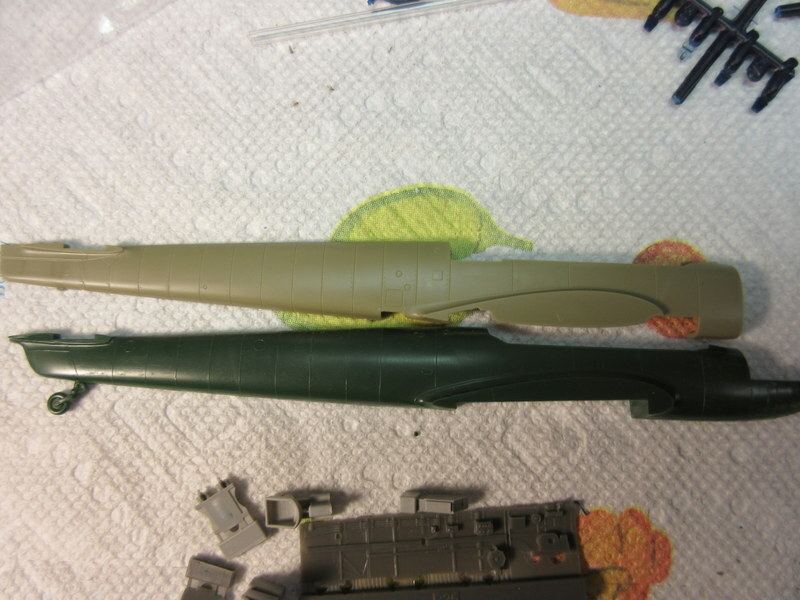 Here are both fuselages together. Here are the Eduard sets. The cockpit detail and the small size of the parts is amazing! 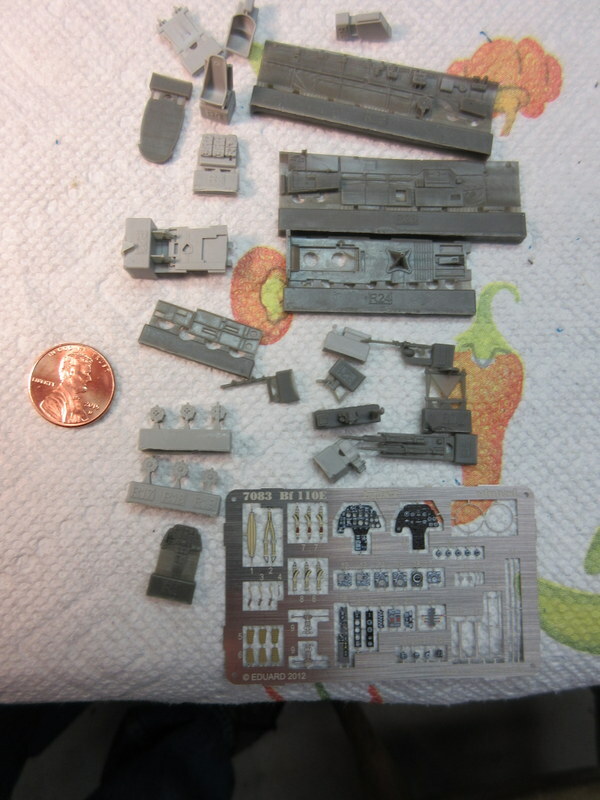 Upon further investigation the etched detail with the Profipack was far superior to the fret in the Bf-110 Big Sin cockpit set and I’ve decided to build the Eduard Profipack out of the box with the neat etch they give you with that kit. 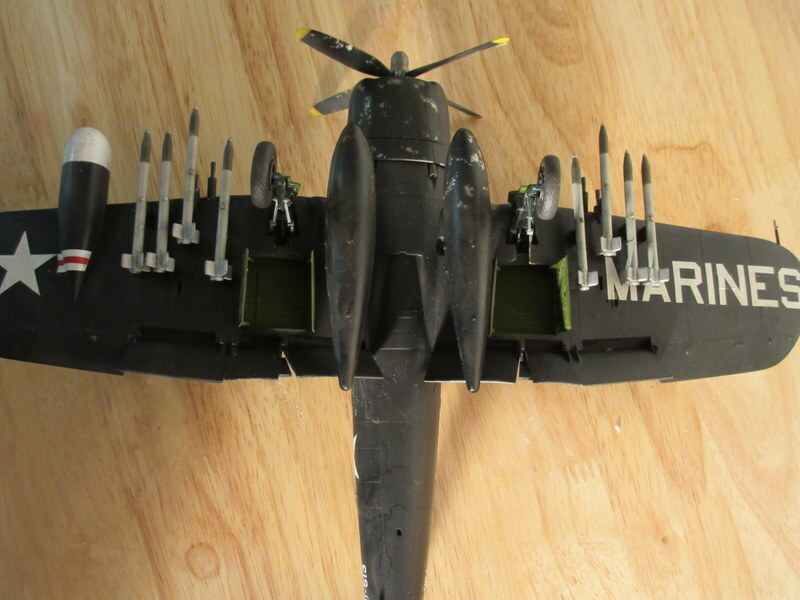 I’ve ordered another Eduard Weekend edition of the Bf-110 (on sale at Squadron for 11.97) and will us the Big Sin set on it and use it’s cockpit in the Monogram set. 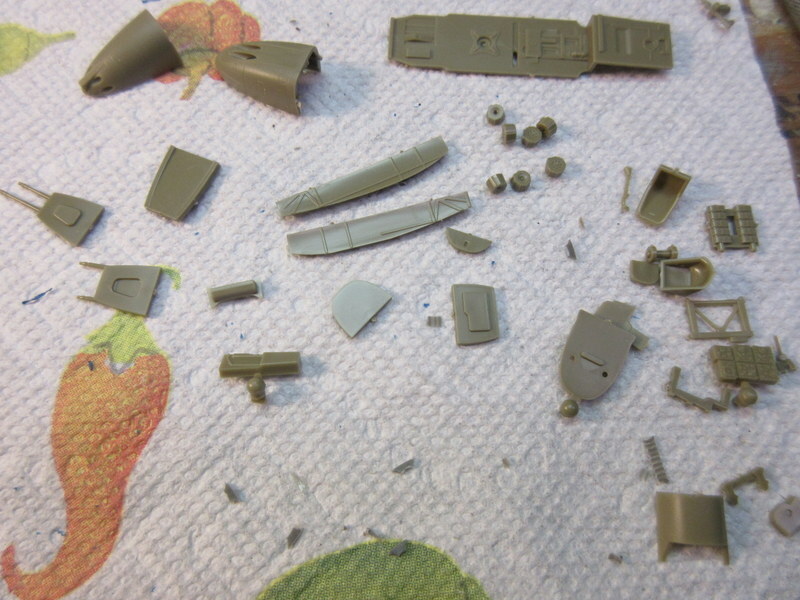 I’ll build the Weekend edition using all of the Big Sin parts including engine and nose gun bay. I have another Owl sets of decals for a tricky North Africa camo that will be the topic of a later post. 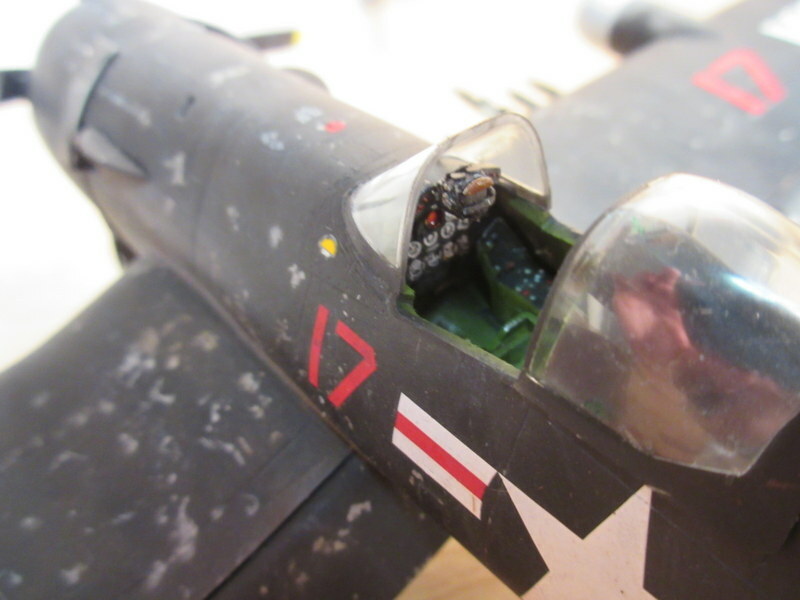 Here the Profipack cockpit underway. After fidgeting, filling, sanding, and futzing with the kit and finally masking all of that clear stuff the kit is ready for a pint job. 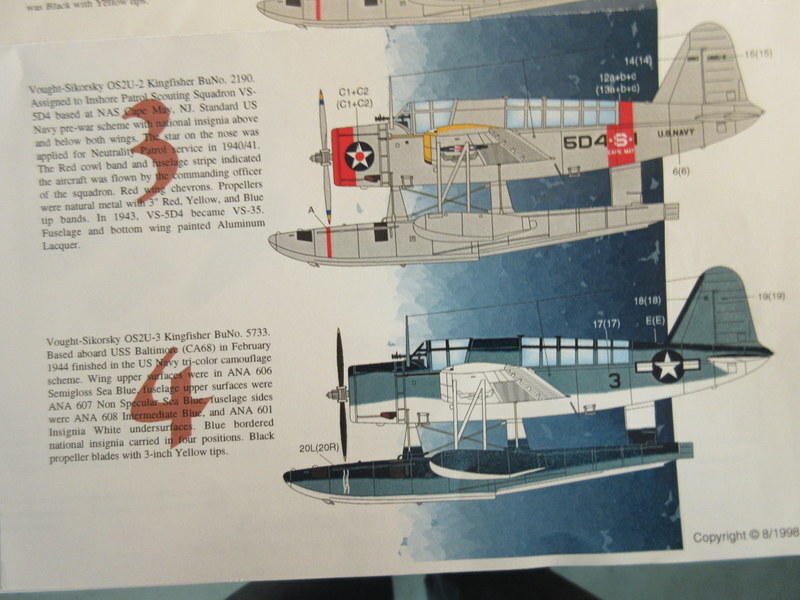 I am using the tri-color scheme on Aeromaster 48-412. A set of very simple markings. Plan to start moving on the white tomorrow. 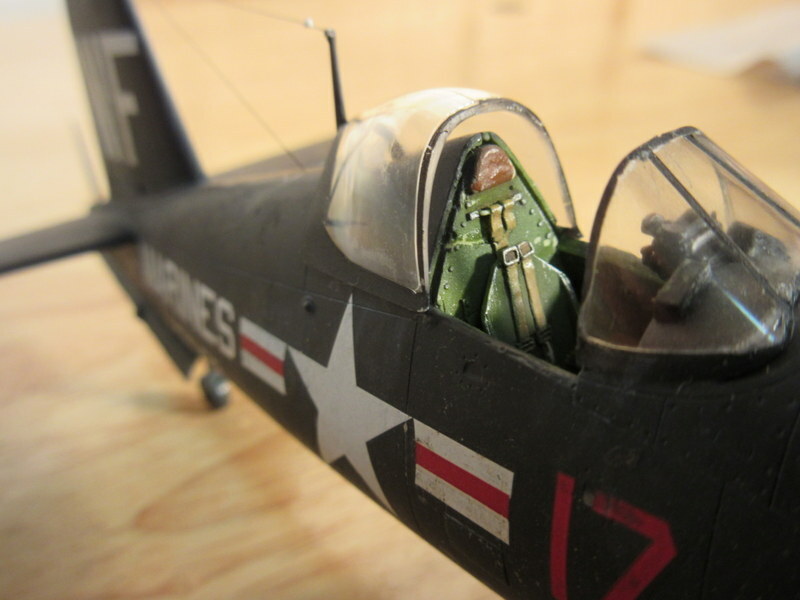 Once done I have a neat diorama picture of a Kingfisher up against a sandy beach being readied for a mission. A chance to blend my water making skills with an aircraft this time. 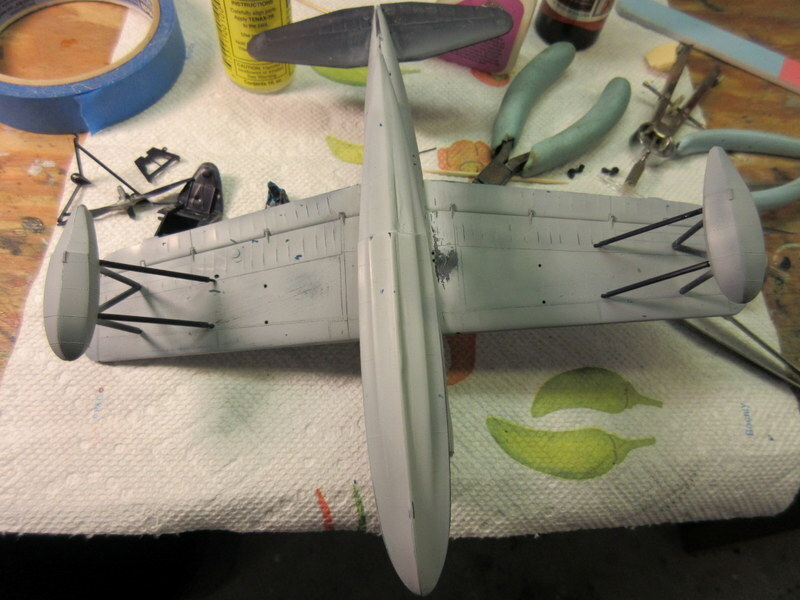 Here the bird ready to go to the paint booth. 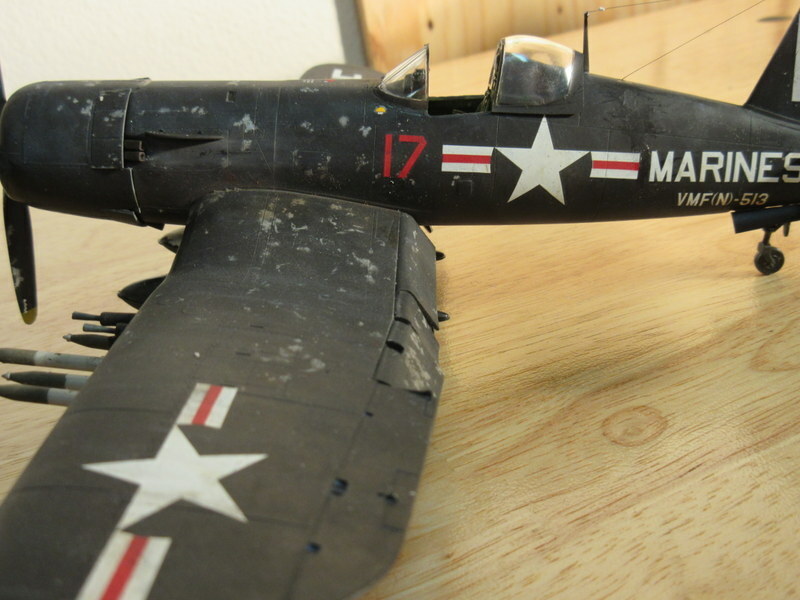 The F4U-5N is done and on the shelf! 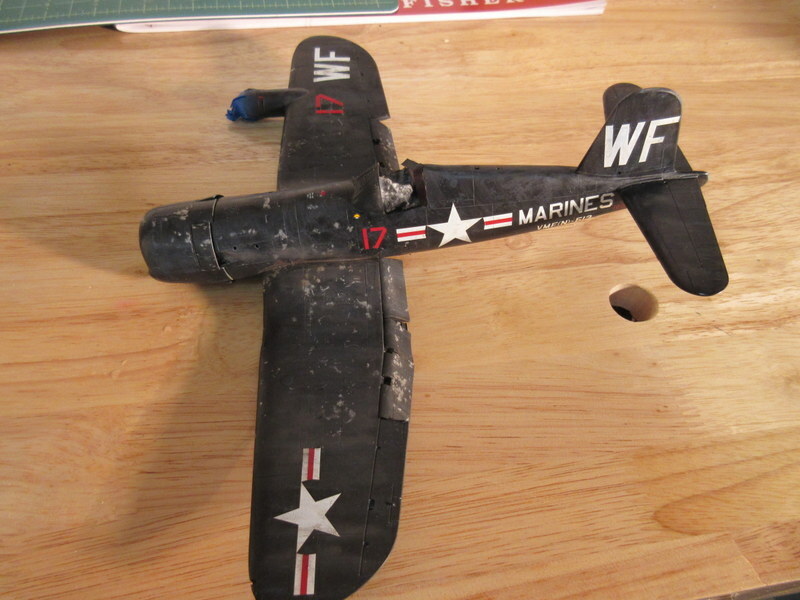 Finished up her landing gear and stores last night and antenna and a few last tweeks tonight. What did I learn from this build? 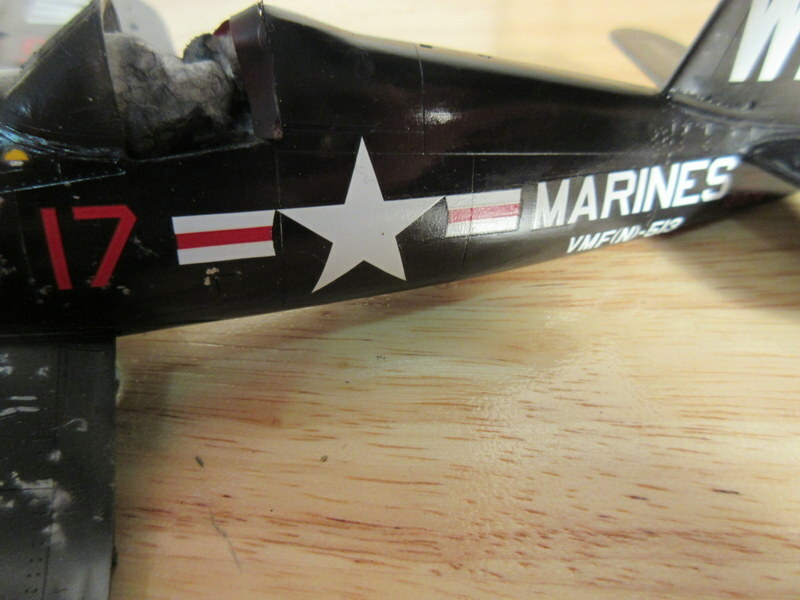 Don’t use the really runny super glue straight from the bottle 🙂 I tried to quickly fix the antenna and the glue ran down the side of the airplane, requiring a quick paint touch up! Here are some finished shots for my 5th model this year. Getting a bit behind the two models a month quest! Gosh it’s been awhile since I posted. 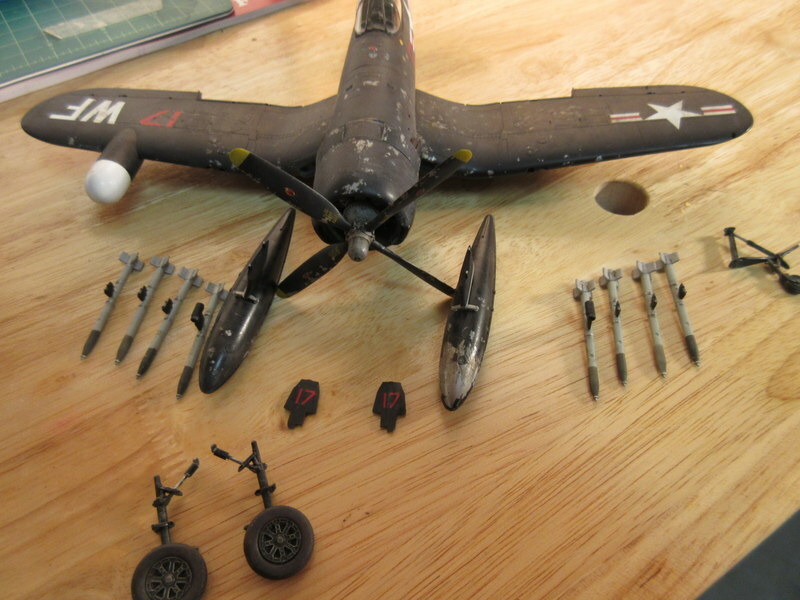 I’ve been working steadily on the F4U, sometimes only 30 minutes at a shot but I am making progress (and on the Kingfisher too!). 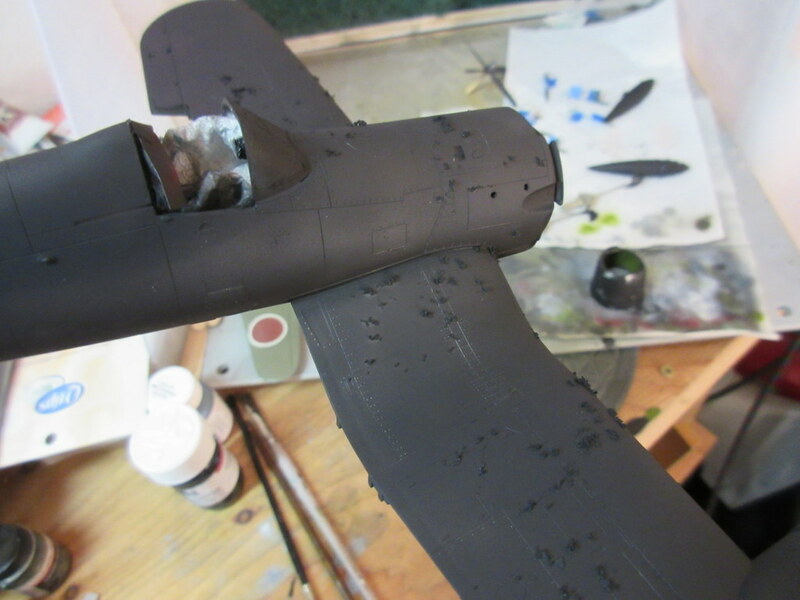 After painting it black I put a couple of coats of Future on the kit in preparation for decals. I usually hand brush the Future since I haven’t had good results with the airbrush. Maybe someday I’ll get that process down but the hand brushing seems to work, I just have to make sure I work the bubbles out of the coat. Time for the decals..
After putting on the decals it was time to grub it up a bit. This time I worked in three filter washes. 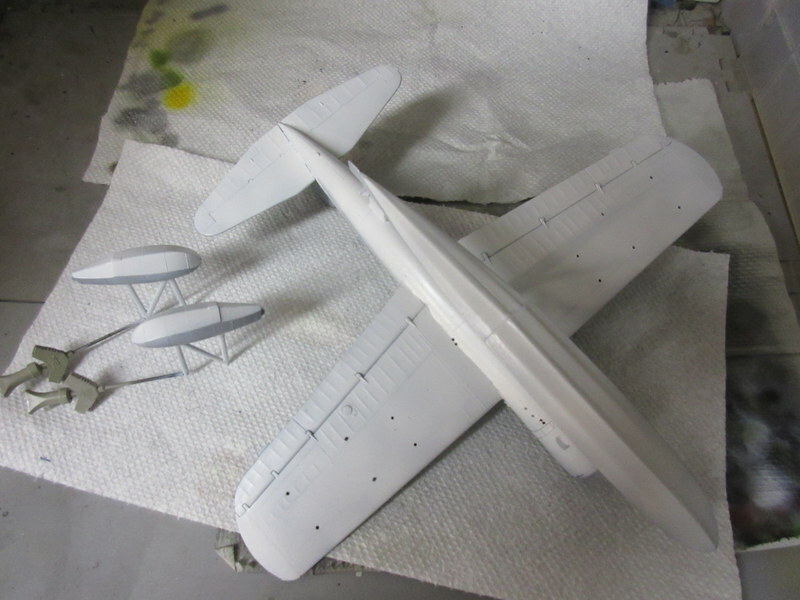 First was my usual wash of raw umber thinned down and coated over most of the aircraft. I’m not sure what effect it has on an all black aircraft as it wasn’t as apparent as it usually is. Next I applied a couple of shade of blue and did a dot wash. This is where you take a dot of oil paint (just the touch of a toothpick) and then use a brush filled with thinner to spread it around in just one are of the model. The idea is to break up the monotone color. I just used blue this time to kind of blue up the black paint. 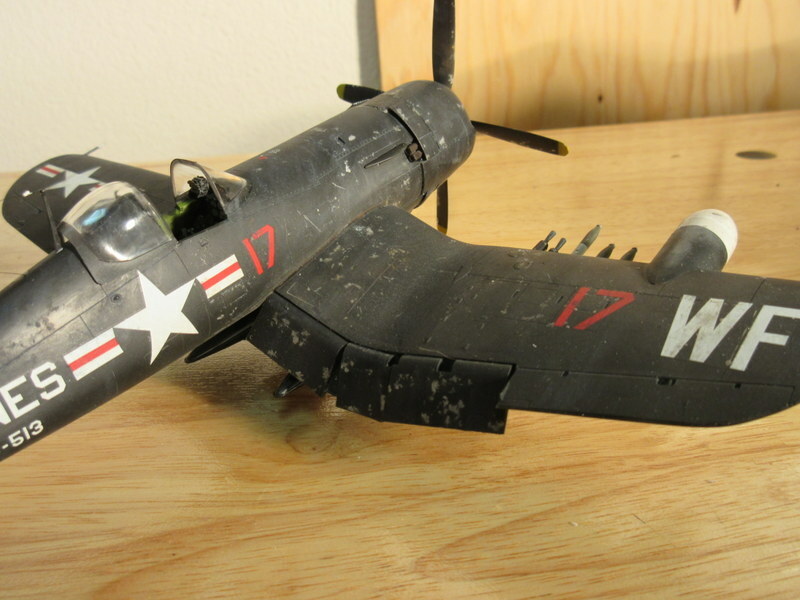 Finally I have been pondering how to get a faded look for an aircraft that spent a lot of time sitting in the sun. 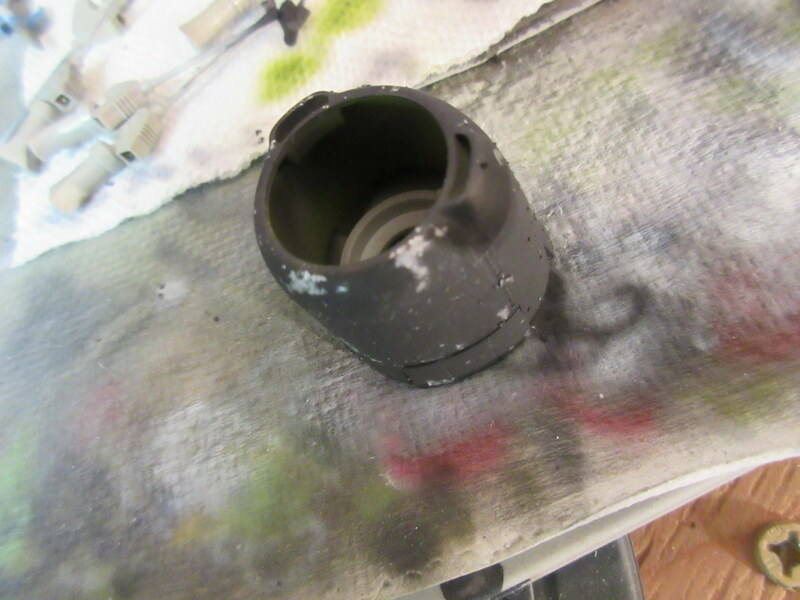 I used my oil filter wash by putting some streaks of white oil pint on the kit and then gradually spreading it out and removing some with a thinner soaked brush. 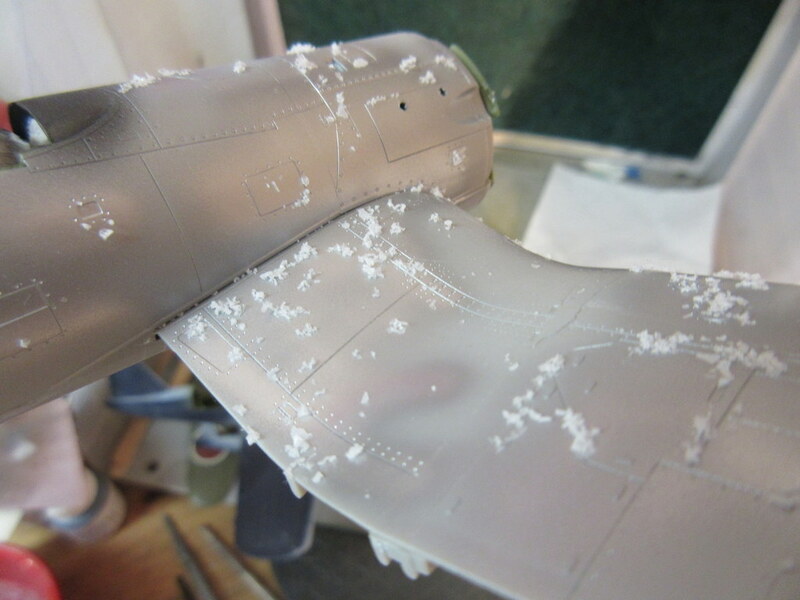 The idea was to streak wash the kit so it not only faded but had the effect of weather running down the sides. The photo look like I did too much but as you will see when I finish with pastels and overcoat the effect is more subtle. The it was time for pastels. Various shades of grey from a dark charcoal to a light great were applied randomly around the frame. 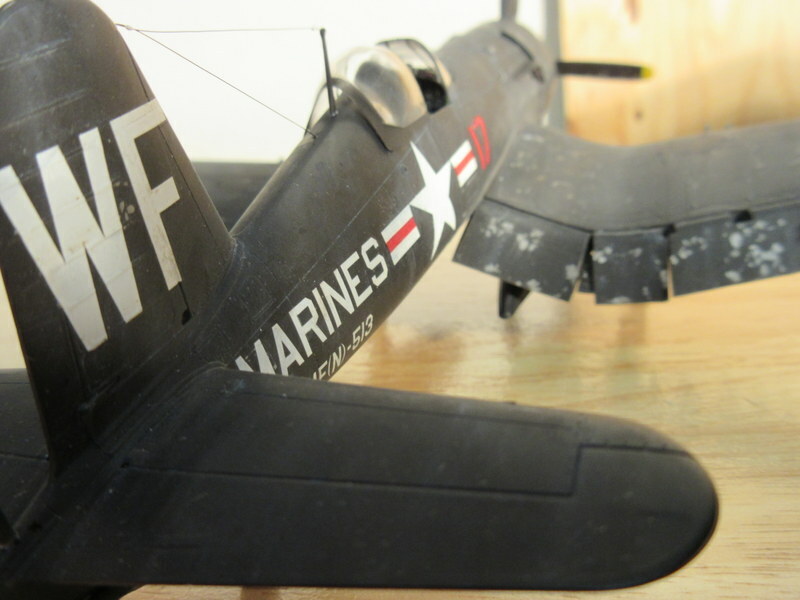 I also used a few shades of brown along where pilots and mechanics would walk, as well as around the lower part of the aircraft subject to ground dirt. Last a coat of Testors Dullcoat, which does a good job of darkening and dampening down the effects of the weathering a bit. And here she is waiting for the final attachment of sub assemblies. I haven’t posted for a bit. I’ve been busy with many of the other spare time hats I wear and kind of fell of the attempt to build two kits per month. Here is is the end of April and I’ve only popped out four kits and the two I’ve been working on get a little attention here and there. 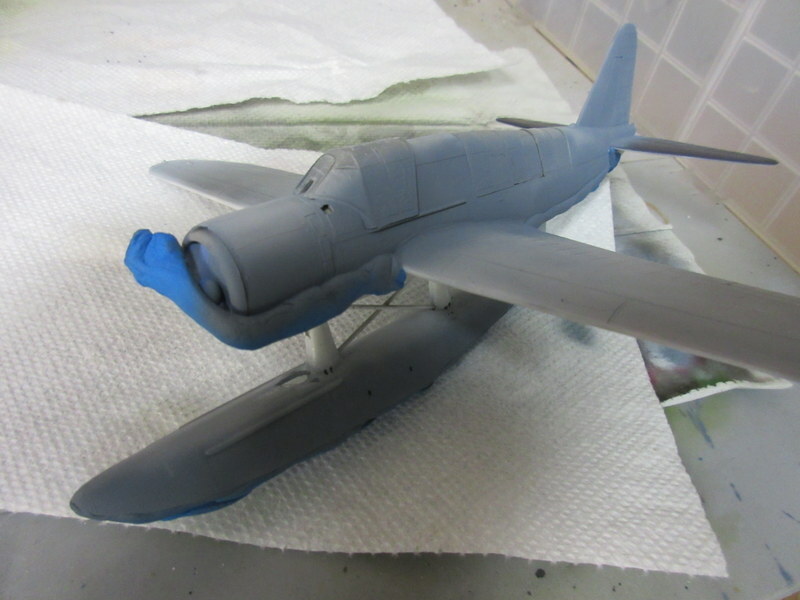 I’m in the painting stage of my F4U-5N. This is going into a Korean bird all black camouflage. 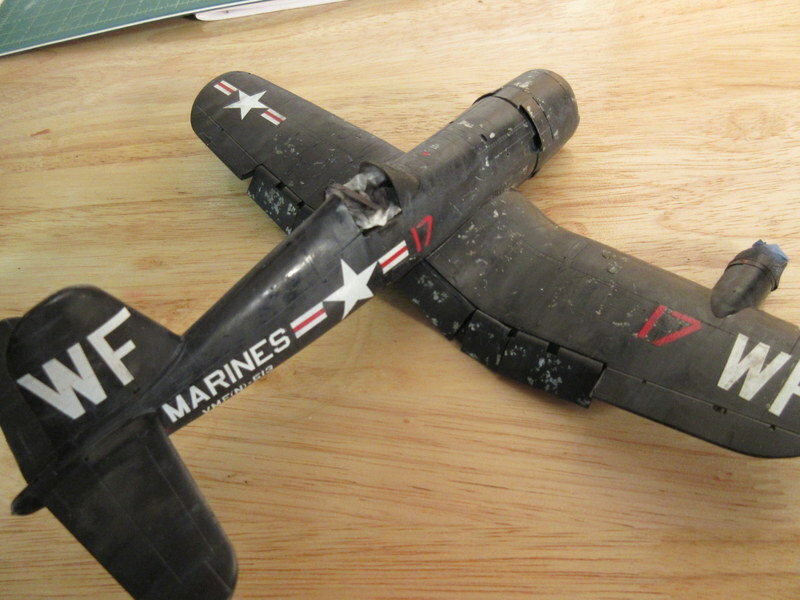 I bought the Montex set to do this with red markings but that’s a Navy bird and since the son is in the Marines I’ve decided to do the Marine markings on the Eagle Strike Corsairs over Korea Part 1. I am trying the salt paint chipping strategy on this one. 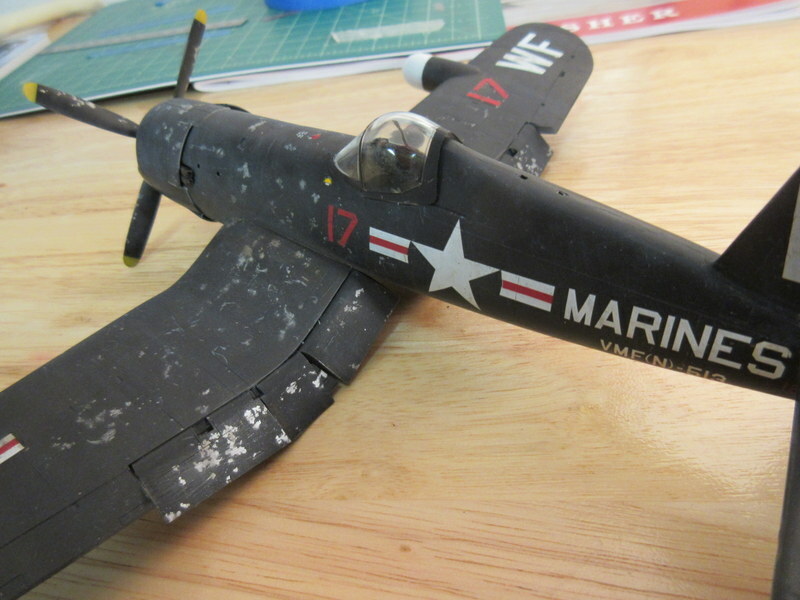 I used it previously on a P-61 I painted all black (see earlier posts) but felt I over did it. We are trying to be more subtle this time. 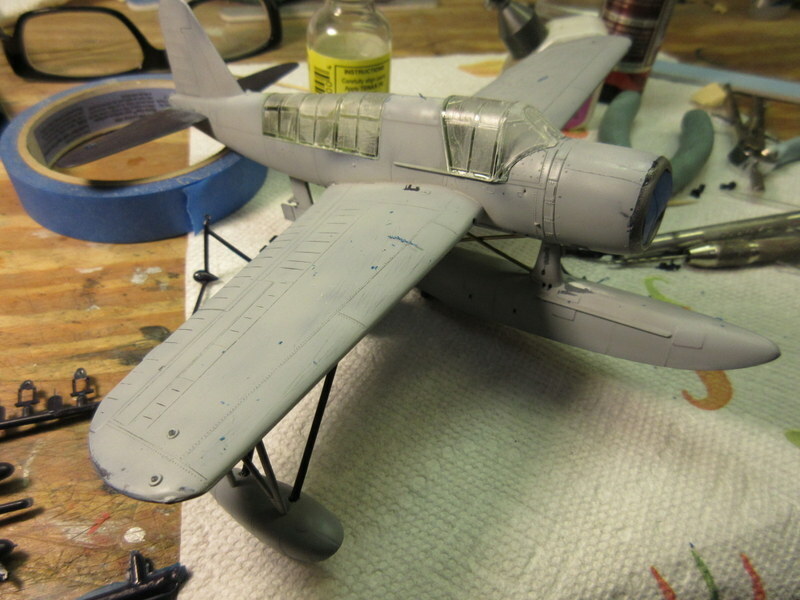 I painted the plane Floquil Bright Silver as a base. Last time I used a duller Aluminium and it didn’t show as well so we will see how well the bright color work. Then salt is then applied by putting water with a drop of detergent down in key spot, shake salt on it, and carefully move the salt around and with a small brush. 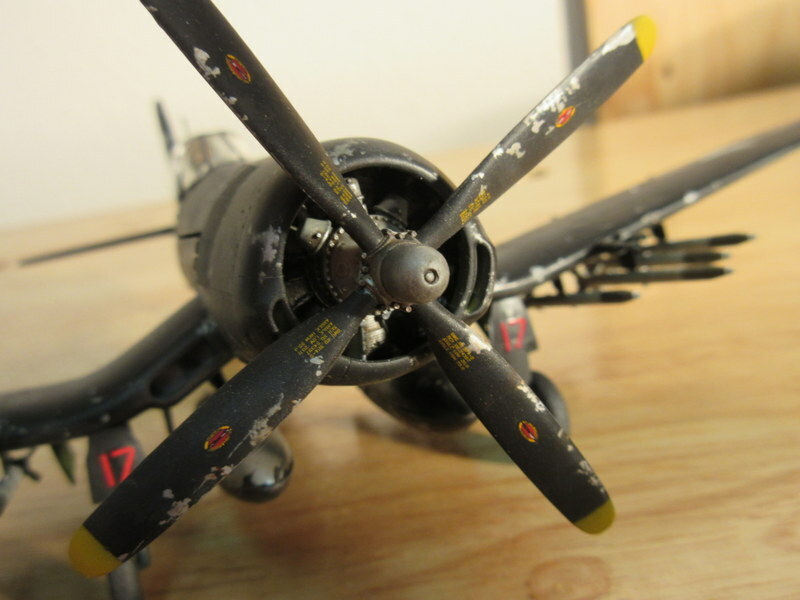 Where the salt went down heavy I knock a bunch off as opposed to leaving it like I did on the P-61. 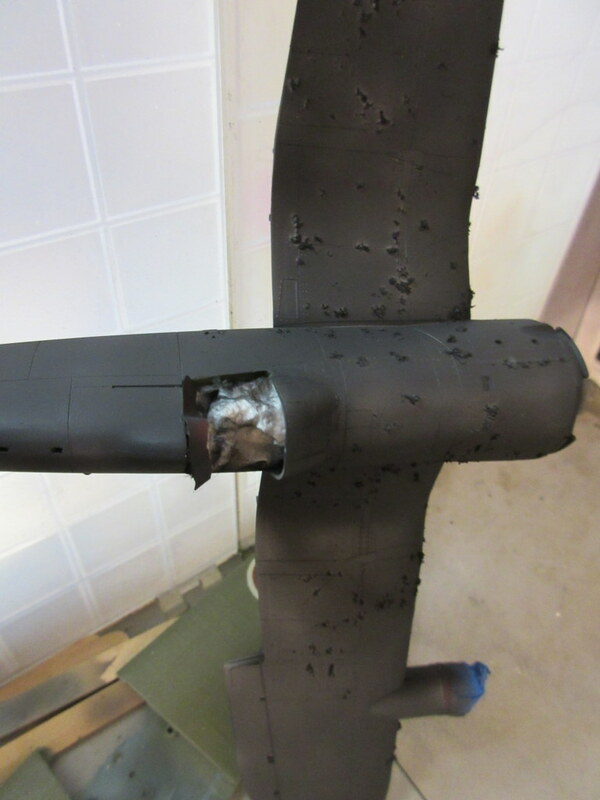 Next a lot of black spraying. 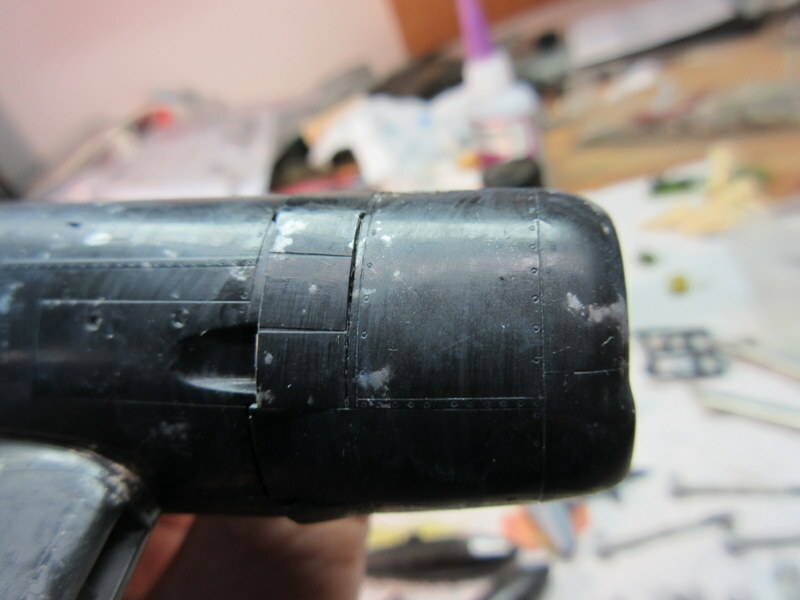 I used Scalecoat Engine Black and it went on very well. This paint is supposed to be a Floquil replacement for railroad modelers and I like the way it performed tonight. 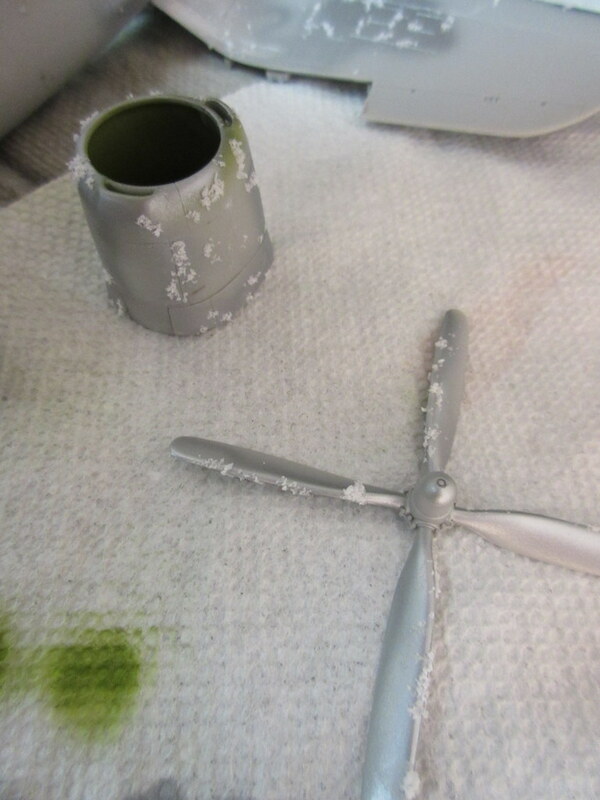 Here are a few shots of the finished paint on the kit. In a couple of spots I have knocked off the salt to see what it look like. 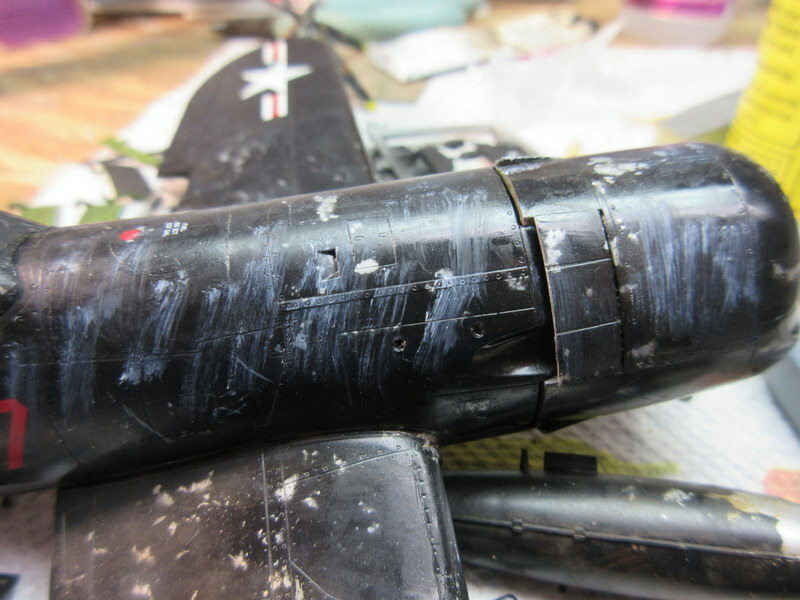 And finally, when your all done and the airbrush is cleaned, now is the time to find out you missed the back of the bird. I’ll have to fire up the black blaster the next session.